What’s the effect of changing your profile image? On Tuesday the LGBT rights group Human Rights Campaign began encouraging supporters to change their Facebook avatars to a pink and red equals sign, their (temporary?) logo. Â In true generative fashion they have also adopted remixes of the logo, which they are displaying on their own site (see left) and they are using the increased awareness brought by the campaign, and by the gay marriage cases currently in the Supreme Court, to raise money for their organization. Â They’re a savvy bunch. So the avatar campaign seems to be good for HRC, but what’s the effect on marriage equality? Because changing one’s avatar seems so easy, the term “slacktivism” has popped up again in a range of news stories. 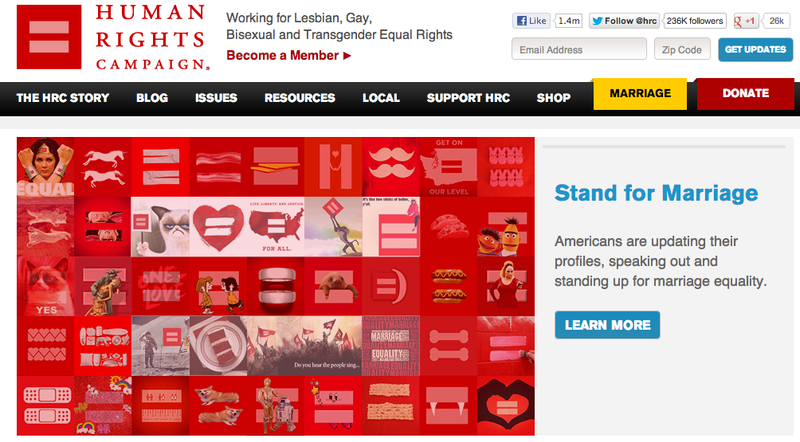 HRC said on their Facebook page, “Make sure you wear red to show your support for marriage equality. And make your Facebook profile red too!” Â but they don’t explain their reasoning. Â The Supreme Court is unlikely to be affected by changing avatars. Â They are already deliberating. Â But the real effect of this kind of action isÂ changing culture by changing hearts and minds. How does that work? Â Short answer: network effects.Â You are a strong supporter of LGBT rights so your change your Facebook profile pic. Â It takes little time, and it makes you feel good, so why not? Â The fact that you changed your profile image appears in your activity feed and your friends see it. And that’s how culture changes: changing fence-sitters into supporters, supporters into advocates, and shaming die-hard opponents into isolated silence. 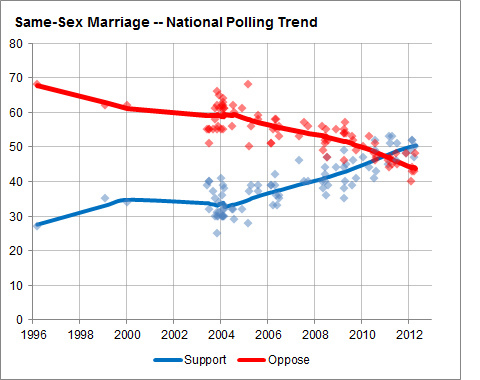 By now, everyone has seen the poll above, which shows opposition to gay marriage decreasing and support increasing. Â Actions like HRC’s keep those trends moving in the right direction. Â It’s hard to measure a change in culture, especially the effect of a particular campaign, but every little bit counts, especially when the goal is so monumental. This is a huge misperception. Â Facebook and Twitter messages are not sent and received by machines, they are sent and received by people – who live in the real world! Â If I am pro-LGBT online, that reflects an actual state of mind. Â If my mind is changed online, that’s the same mind I use when I discuss the Supreme Court case at the dinner table, when I choose to use or not use a homophobic slur, when I decide who to vote for. Â When online activity changes hearts and minds, it changes culture in the real world as well.